I just wanted to say how great I think the dogmatic is! 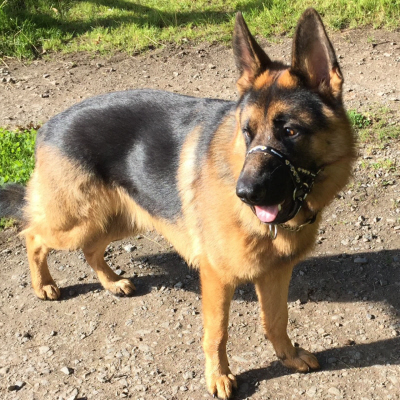 My 1 year old male GSD walks fairly well on the lead when we're on our own, but he is extremely friendly and wants to greet every dog he sees whether I want him to or not. If the other dog is on the other side of the road, it can be difficult to keep him from pulling us both across. He is 33kg and very strong with typical adolescent selective deafness! We're working on his impulse control, but in the meantime the dogmatic has been a godsend for keeping us both safe. I have attached a picture of him wearing his dogmatic, and please feel free to use it and my comments as a testimonial to your wonderful product.